Hublot's partnership with the American skier Bode Miller is being sealed today with the launch of the "Bode Bang" in New York, in the presence of the legendary champion of the skiing world. The bad boy of skiing, and world champion in all disciplines in 2008, now has a Big Bang named after him! The partnership between the watchmaking brand and Bode Miller came about when the skier visited the manufacture's workshops for a photo shoot for the Kjus catalogue. Fascinated by the know-how and meticulousness of the watchmakers, he set out to craft his own watch. 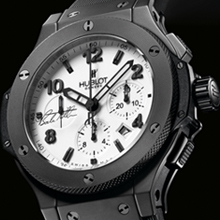 His meeting with Jean-Claude Biver, the CEO of Hublot, led to an immediate mutual understanding. Both passionate, direct men with an expressive and unconventional manner of speech, they quickly found a host of shared values. The talented, feisty and determined skier, and the inventive, exceptionally energetic boss both demonstrate great generosity through their involvement in supporting humanitarian causes. The creation of the Bode Bang presented today is the fruit of this bond: together, they decided to divert some of the watch's royalties to the Turtle Ridge Foundation, founded by Bode Miller and his family in 2005 (www.turtleridgefoundation.org) to share his success with those less fortunate in life, an ambition equally dear to Jean-Claude Biver and Bode Miller.